Both of these quotes were found on John Piper’s blog made by Bill Walsh. I love both of them. I hope it’s clear that my art is “representational” of the God of the universe – Maker of heaven and earth – He is the One I serve! My heart’s desire is to use these art pieces for His glory – and no other’s. This is a painting I did from some pictures of Laura’s wedding her Mom sent me. 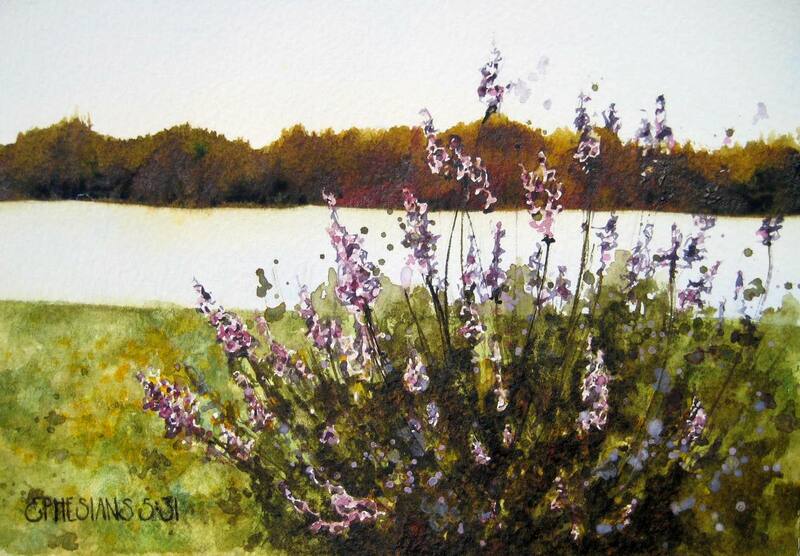 I loved the lavender bush with the lake behind it. This is one of your best for me! I love the beauty and the idea of the crystal clear water with the coolness of the shade trees in the distance. My daddy always loved Center Hill Lake and we spent so many summers there that my children’s children even grew to love it’s wonder and beauty. Thank you for this precious memory. This is one of my favorite paintings I’ve seen on your blogs so far!! Thanks Barbara & Jonathan!!! Barbara, you’re always so kind to leave me comments – love that this one brought back good memories too. Jonathan, thank you – I’m glad you like it – I gave it to Jennifer Lorance to give to Laura – I hope they like it as much as you do!